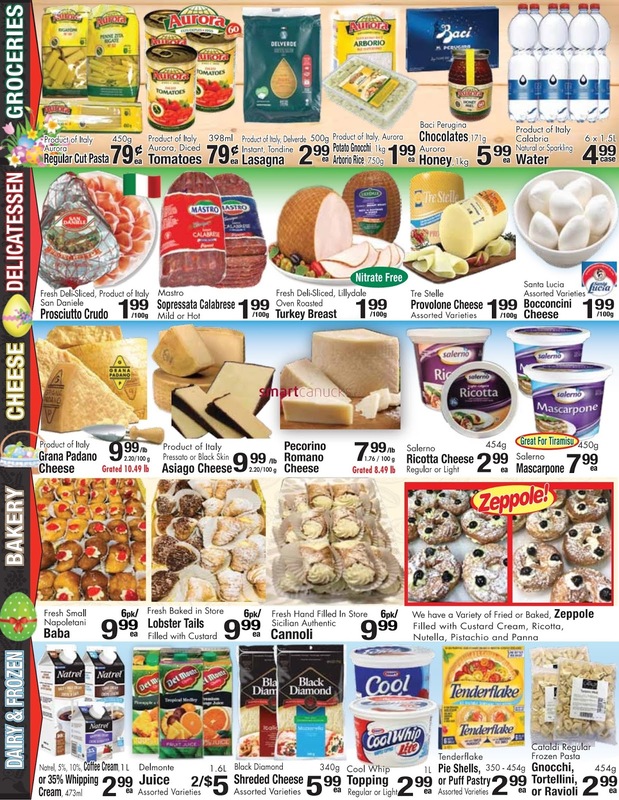 Cataldi Fresh Market Flyer March 28 - April 3, 2018 - Product of Italy Grana Padano Cheese 9.99 /lb 2.20/100g Grated 10.49 lb. Product of Italy Pressoto or Block Skin Asiago Cheese 9.99 /lb 2.20/100g. 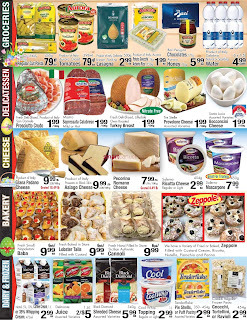 Cataldi Fresh Market Flyer Pecorino Romano Cheese 7.99 /lb 1.76/100g Grated 8.49 lb. Salerno Ricotta Cheese Regular or Light 454g 2.99 ea. Salerno Mascarpone 450g 7.99 ea. Fresh Small Napoletani Baba 6pk/ 9.99 ea. Fresh Baked in Store Lobster Tails Filled with Custard 6pk/ 9.99 ea. Natrel, 5%, 10%, Coffee Cream, or 35% Whipping cream 473ml. Delmonte Juice Assorted Varieties 1.65 L 2/5$. Black Diamond Shreded Cheese Assorted Varieties 340g 5.99 ea. Cool Whip Topping Regular or light 1L 2.99 ea. We have a Variety of Fried or Baked, Zeppole Filled with Custard Cream, Ricotta, Nutella, Pistachio and Panna. Homegrown Ontario, Half or Whole Local Lambs 7.88 /lb 17.37 kg. Cut From Canada Grade AA or Better, Beef Prime Rib Roast or Steaks 19.82 kg. Product of Switzerland, Emmentaler Swiss Cheese 9.99 lb 2.20/100g. Product of USA Broccoli 99 c ea. Product of Mexico Red, Peppers 1.99 /lb 4.39 kg. Product of Italy, Basso Unfiltered Extra Virgin Olive Oil 750 ml 6.99 ea. Salerno Whole Friulano Cheese 5.99 /lb 1.32 /100 kg. Tenderflake pie sheels 350 - 454g or Puff Pastry Assorted Varieties 2.99 ea. Cataldi Regular Frozen Pasta Gnocchi, Tortellini or Ravioli 454g 2.99 ea.